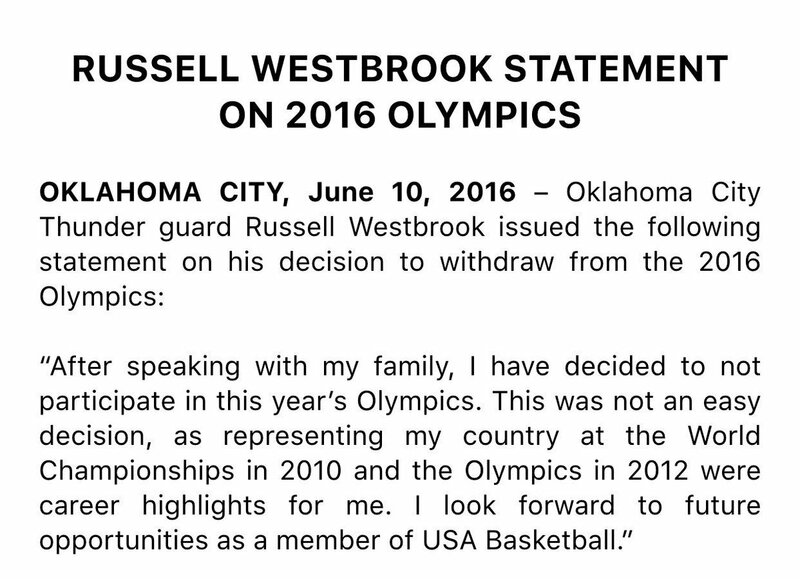 Russell Westbrook will not play at the 2016 Olympics in Brazil after winning gold with USA Basketball in 2012. Oklahoma City Thunder guard Russell Westbrook has decided to withdraw from consideration for the 2016 U.S. Olympic basketball team headed to the Summer Games in Rio de Janeiro. Westbrook averaged 8.5 points, 1.6 assists and 1.6 rebounds in eight games for the U.S. at the 2012 Olympics in London, where the team captured its second straight gold medal. The American squad will also be without stars LaMarcus Aldridge, Stephen Curry, Anthony Davis, Chris Paul, Blake Griffin and John Wall in Brazil as they all have chosen to skip the tournament due to injuries. James Harden also announced on Friday that he would not be competing in the Olympics either. No basketball player has withdrawn due to concerns about political unrest or the Zika virus in Brazil. Kings star DeMarcus Cousins was reportedly informed that he will be a member of the 2016 Olympic team.